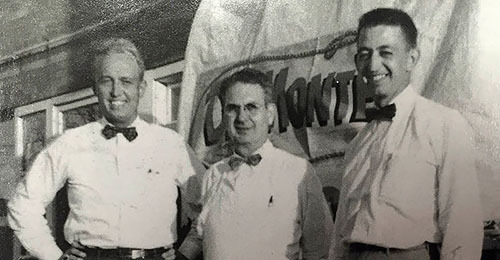 Teammates of Schnuck Markets, Inc. have been serving customers a unique combination of quality food, variety and value for more than seven decades. Founded in north St. Louis in 1939, the family-owned grocery company has grown to include nearly 100 stores in five states: Missouri, Illinois, Indiana, Wisconsin and Iowa. To find the closest store to you, please visit our store directory. The seeds for the Schnucks of today were sown in 1937, when Edwin Schnuck started his own wholesale meat business. Two years later, his wife, Anna, opened the family’s first retail store – a confectionery in north St. Louis. Their oldest son, Edward (Ed), followed his parents’ lead and also opened a corner store in the area. Soon after, two additional stores were opened by second child, Annette, and her husband, Raymond Hanhardt, and their third child, Donald (Don), with his wife, Doris. While separate enterprises, the four Schnuck families operated as one when it came to corporate philosophy, advertising and buying. By 1947, the families had opened seven retail grocery stores among them. Ed sold his stores to join his father in the business he had established at 4356 Manchester in St. Louis. Later, Don and Doris sold their store to assist in the acquisition of a second major grocery location in the St.Louis suburb of Brentwood. Schnuck Markets soon became established as the “Meat Masters” with excellence in meat products. Those two locations became the nucleus of the company today. In 1952, Edwin and his two sons incorporated as Schnuck Markets, Inc. They had learned a lot about managing a grocery store from serving independent grocers in their wholesale meat business. That experience also gave them a solid foundation for developing the outstanding meat departments for which Schnucks is still known today. Schnucks also became known for the friendliness of our teammates. The friendly atmosphere of the stores so delighted customers that they frequently wrote enthusiastic letters and shared genuine compliments about teammates with Schnucks managers. In 1961, Schnucks adopted the slogan “The Friendliest Stores In Town” to highlight what our customers felt was our primary strength. By the late 1960s, Schnucks was operating 10 modern, state-of-the-art stores in the St. Louis area. The times were revolutionary! Schnucks was the first major food retailer in the St. Louis area to drop popular trading stamps andreplace them with “The Price Revolution” campaign that substituted lower prices for trading stamps. A new symbol accompanied this theme – our friendly saluting soldier – which is still one of the most recognized corporate logos in St. Louis. 1970 was a year of growth! And that growth occurred more rapidly than anticipated when Schnucks acquired the Bettendorf-Rapp chain of stores in St. Louis and more than doubled store count overnight. That purchase put Schnucks in a position to serve a greater number of customers throughout the St. Louis metropolitan area. In March of 1970 Schnucks announced the grand opening of Medi Mark, the family pharmacy at Schnucks Hampton and Gravois. This was the first combination food and drug store for Schnucks and our first pharmacy location.We have since expanded to 95 in-store pharmacies. Our pharmacies offer convenient, one-stop shopping with prescriptions filled while the customer shops. As the needs of customers changed, Schnucks became a leader in developing combination food and drug stores beginning in the mid 1970s. These full-service food and drug stores offered customers the convenience of more products and services under one roof. We remain committed to this format today as we continually add and modify the exact product mix in each store to match our customers’ desires. In our ongoing effort to offer unique, high-quality products to our customers, we began adding manufacturing facilities to our operations in1961 with the opening of our first bakery plant. In the early 1990s, we consolidated our food preparation in one central USDA-inspected kitchen, where entrees, side dishes, salads and smokehouse specialty items are prepared for retail sale in our deli, Chef’s Express and meat departments. Our manufacturing operations have relocated through the years to accommodate growth and gain the advantage of technological advancements and innovations which help us better serve our customers. The 1980s and 90s also marked a transition in leadership at Schnucks from the second generation of the Schnuck family to the third. Overseeing operations of the company today are the six children of Don and Doris: Scott, Todd, Craig, Mark, Terry and Nancy, as well as Stephanie – Ed and Marilyn’s only child. 1995 was another banner year for Schnucks. In June, Schnucks acquired 57 stores from National Supermarkets, our single largest competitor in the St. Louis metropolitan area. In 1998, we entered the Rockford, Ill. market with the acquisition of Logli Supermarkets. Being family owned, there were many similarities between Logli and Schnucks, which facilitated the transition for Logli customers and teammates.To better compete in the Rockford market, Schnucks acquired seven area Hilander stores from The Kroger Company in 2011. Schnucks now operates 11supermarkets in the Rockford metropolitan area. In 2005, Schnucks opened the first Iowa store, in Bettendorf, offering savings, service and selection to the Quad Cities community. At Schnucks, growth and change are two constants. As our customers change, we change to meet their needs. As the neighborhoods we serve grow, we grow with them. 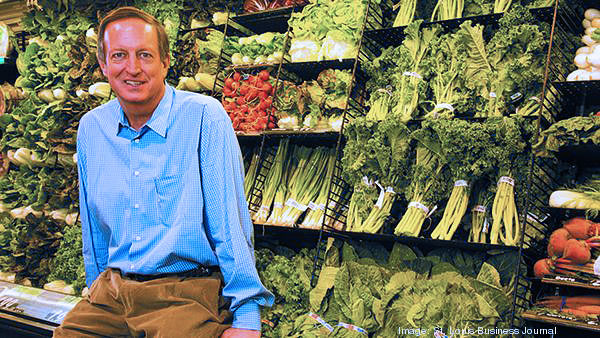 With the past as a predictor of the future, we can count on ongoing growth and change at Schnucks. One thing will never change: our recognition that our customers are our reason for being. Every position in the company exists to help us understand, serve and satisfy our customers.